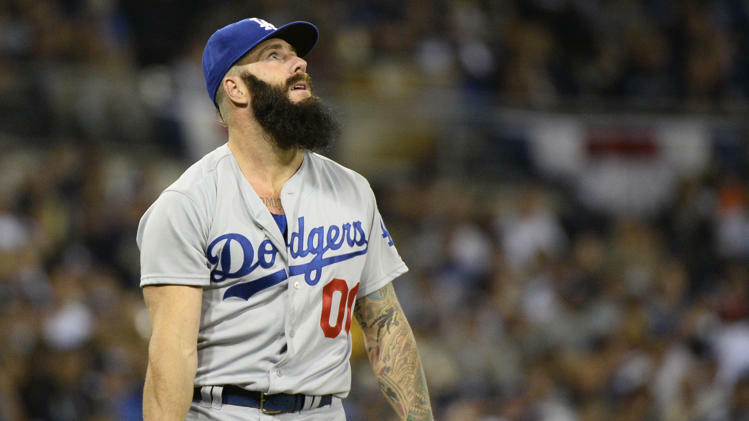 Dodgers relief pitcher Brian Wilson watches a 1-0 lead soar away. The Dodgers snatched defeat from the jaws of victory in the 8th inning of a 3-1 loss to the San Diego Padres last night. After a masterful 7 innings by Hyun-Jin Ryu, reliever Brian Wilson, the Beard from the Bay, blew just about everything he touched, giving up a pinch-hit homer to new Padre Seth Smith and then booting and bobbling a couple of bunts for two more runs. It was painful to watch. It wasn’t all Wilson’s fault, though. The defense was just plain shoddy in that inning. Of course, if your team can hit, they can afford a little shoddiness from time to time, but the Dodgers couldn’t really hit in this game either. The heart of the batting order went 0-15. Ain’t gonna win many games like that. Shake it off, boys. You’re better than that. Enjoy your Monday in beautiful San Diego, and then get them good tomorrow. Go Dodgers!